Take a look at this cartoon. If you are like me, you have a number of different reactions to it. At first, I said, “yes, I understand that Jesus might not even recognize what many churches in our culture have become.” Then again, I felt a bit irritated because I thought that maybe the artist (a great guy, David Hayward) was being a bit too cynical about Jesus’ relationship to HIS body. I mean, how can Jesus, whose body we are members, be disconnected from that which is actually His own manifestation on earth in fleshly form? I don’t think David was attempting to say the latter…for Jesus can never be separated from that which is actually His. Each of us are precious members of His body, grafted in by love and mercy, graciously gifted with aspects of His own very nature to be able to fulfill our call to be difference makers in today’s world to HIS glory. Even so, I do believe David is pointing out something profound about what the INSTTITUION of the church has become. In many respects, we all need to ask ourselves about whether Jesus would actually “befriend” organizations like that which many of us see in our culture. And believe me, I’m not pointing fingers. I have as much “guilt” on my shoulders as anyone else. There have been times where I have been MUCH MUCH MUCH more concerned with building MY kingdom and not God’s. There are times where I am much more interested in “ear tickling” and keeping people happy in institutional living than speaking the truth of what God calls us to be and do. The truth is, anything short of each gathering of followers of Jesus being totally committed to faithfulness to God’s call to be and make disciples becomes, over time, an “imaginary friend.” To claim that we are faithful to Jesus while we put more energy into institutional life than Kingdom life is a sham. To be doing that which entertains at the expense of sacrificial living, personal life transformation and disciple-making DNA is nothing more than that which must stagger the imagination of Jesus. I’ve been making my way through the gospels again and I must admit, I don’t recognize the Jesus I read about as someone who is hanging around many contemporary churches. Pragmatism, “how to-ism,” light shows, jumbo jet dB levels of music, pastoral “idolatry,” and massive dollars spent on elaborate palaces dispensing religious goods and services simply appears to be out of step with who Jesus was and is (as I read the gospels). I’ve said it a lot lately; any institution that purports to be serving Kingdom interests must be more of a reflection of the life and ministry of Jesus than that of the paradigms of the 20th century. No, I’m not idolizing the first century because I know we live in unique times. This is OUR time to be faithful to God in our world and culture. Yet to sell out to culture and turn discipleship into consumables is far from what I believe Jesus intended. So David, I think you might be right. 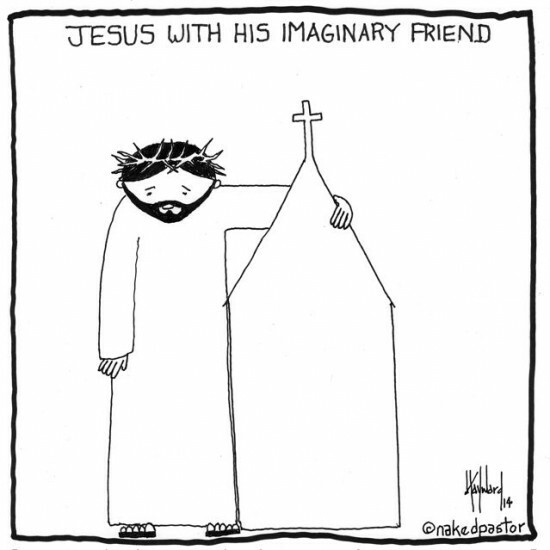 Jesus might have an imaginary friend not so much because of HIS heart but because of ours. May we always not only find our identity in Jesus’ love for us but may we live out our community’s lives as if Jesus IS our friend and be something He would recognize as faithful to His call and worthy of the investment of His Spirit. ← The Ongoing argument – Are you a Saint or a Sinner?